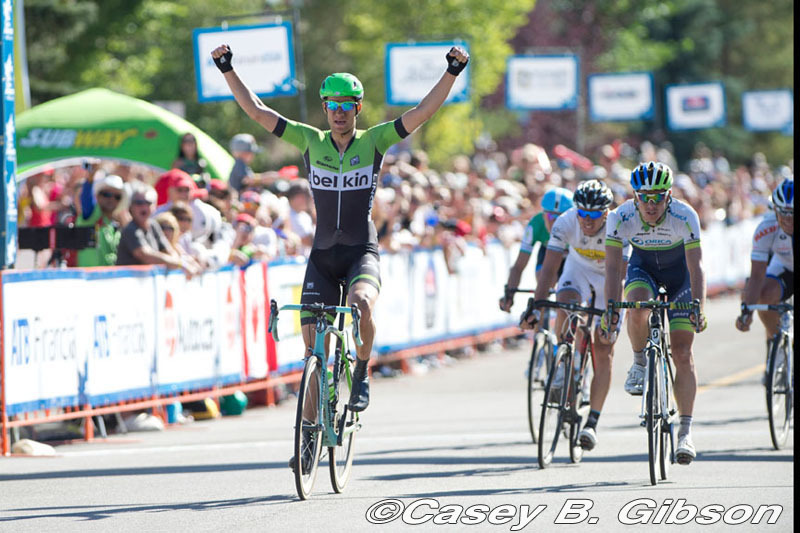 The Netherlands’s Theo Bos outsprinted South Africa’s Daryl Impey of Orica-GreenEDGE to help Belkin-Pro Cycling win its second consecutive stage of the Tour of Alberta, presented by ATB Financial, Saturday at Strathcona County’s Sherwood Park. Countryman Tom Dumoulin of Team Giant-Shimano finished with the overall pack to maintain his eight-second lead over Ruben Zepuntke of the Bissell Development Team. Impey, received a six-second time bonus because of his second-place finish, moving him up to third-place overall and nine-seconds back. The final day of the 2014 Tour of Alberta concludes Sunday with a hilly, 11-lap, 11.27 kilometre circuit in Edmonton’s Centre City. Sinday’s final stage will contain mid-race time bonuses, as well as finish bonuses, which may alter the strategy for teams. Besides Repuntke and Impey, other remaining danger men all with in 30 seconds to dethrone Dumoulin’s lead include Garmin-Sharp’s Ramunas Navardauskas of Lithuania; Jelly Belly p/b MAXXIS’ Serghei Tvetcov of Romania; Canadian’s top placed rider Ryan Anderson of Optum p/b Kelly Benefit Strategies, and perhaps Pieter Weening of Orica-GreenEDGE, all of whom are good climbers on the type of short, punchy climbs the peloton will face in Sunday’s finale. “I don’t think I can make up 16 seconds and take the lead,” Anderson said. “But, my goal is to steal some time and jump up a couple of places.” Anderson and his team entered the race with hopes of a Top 5 finish. 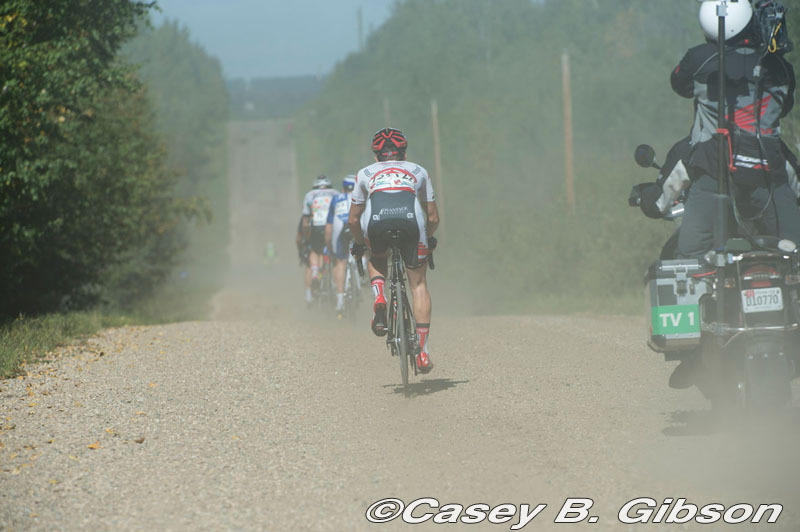 Saturday’s stage was the longest of this year’s Tour of Alberta, winding 163.5 kilometres from Edmonton’s Northlands to Strathcona County’s Sherwood Park. The stage included six sections Canadian Pave, or “dirt-controlled roads”, with three fast, flat, 2.8 km circuits, which set up the win for Bos, a multi-time world champion in track cycling and a silver medalist in the 2004 Athens Olympic Games. 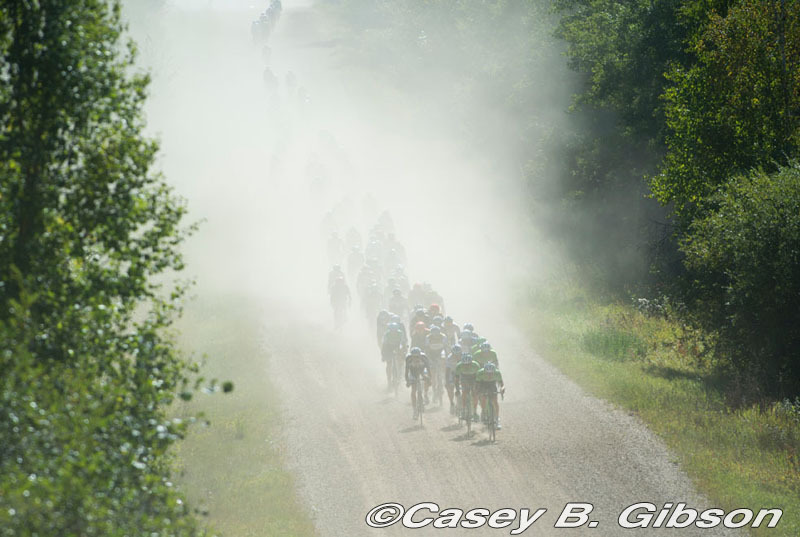 Saturday’s stage saw a breakaway of eight riders early in the race, instigated by Canadian Nic Hamilton of Jelly Belly p/b MAXXIS and pushed by Garneau-Quebecor’s Janvier Hadi of Rwanda. Hadi’s impressive ride garnered him the Simson Maxwell Power jersey as most aggressive rider, the first ever by a Rwandan in a North American race. Sunday’s final stage of the 2014 Tour of Alberta, presented by ATB Financial, starts and finishes at Sir Winston Churchill Square in Edmonton’s Centre City. The stage is sponsored by Pomeroy Inn & Suites. The final stage is 124.1 kilometres and includes 11 circuits 11.3 kilometres in length. The circuit features a steep climb up Bellamy Hill, a short 300-metre hill averaging 20 percent gradient, and a longer climb up Victoria Park Rd. NW up from River Valley Rd. Top viewing spots include Grierson Hill downhill, Bellamy Hill near 101 St., River Valley Rd along Victoria Golf Course, Victoria Park Rd. NW and anywhere within the Churchill Square area. The overall victory of the second Tour of Alberta will be crowned at Chruchill Square at approximately 3:30 pm with the podium presentation on the Festival Grounds at the finish. The Tour of Alberta Festival will be open from 11:00 to 5:00 p.m. featuring games, interactives, big screens to watch the live action from the road and entertainment stage. The Tour of Alberta, presented by ATB Financial is Canada’s biggest professional cycling stage race and ranked as one of the highest outside of Europe. It is sanctioned by the Union Cyclist Internationale, international governing body for the sport and the Canadian Cycling Association, the national governing body for the sport in Canada. Coverage continues on Rogers SportsNet One Friday from 2:00 to 4:00 pm MDT. The event is being televised to 121 countries. The elite, all-professional field is down to 111 cyclists from the 118 that started Tuesday. Athletes from 19 countries are represented in the race. An early breakaway that included two Canadians - Bruno Langlois of Team 5-Hr Energy and Nic Hamilton of Team Jelly Belly p/b Maxxis, as well as members from both Canadian-based continental teams Garneau-Quebecor and Silber Pro Cycling highlighted the fourth and penultimate stage at the Tour of Alberta. The breakaway launched very early with six riders taking off, joined shortly thereafter by a duo of chasers. The group gained a maximum gap of four minutes before the peloton started to increase the pace. The exhausted breakaway was caught by the pack with approximately 5 kilometres to go. On the finishing circuit in Sherwood Park, a few attacks took place, but none created a significant gap. Reacting quickly, the peloton, led by the WorldTour teams, responded to every attempt. At the finish line, Theo Bos of Team Belkin Pro Cycling took the bunch sprint win by more than a bike length after 163 kilometres of racing. Daryl Impey of Orica-GreenEDGE came second, followed in third by Jure Kocjan of Team SmartStop. In the main pack, Tom Dumoulin of Giant-Shimano kept his overall lead and will start the last stage with the yellow jersey on his back. Dumoulin won the opening Prologue at Winsport Canada in Calgary and has been leading the race ever since. Dumoulin has an 8 second lead over Ruben Zeptunke in second place, and a 9 second lead over Daryl Impey in third place. Ryan Anderson of Optum-Kelly Benefit Strategies, who has been wearing the red jersey as the Top Canadian since the second stage, managed to keep the jersey thanks to the bunch sprint. Anderson crossed the finish line in 15th place. Hugo Houle was the top Team Canada member in 14th place, his best placing of the week. Hugo Houle is still the top-ranked team member in the general classification, moving up to 34th. Anderson is the top Canadian in GC, sitting seventh, 16 seconds out of the lead. Team Canada’s Adam De Vos crashed in the second "Canadian Pavé" section and did not finish the race. In the crash, he sustained a wrist injury and has been transported to the hospital for treatment and observation. Garneau-Quebecor's Janvier Hadi, a guest rider from Rwanda riding at the Tour of Alberta, was awarded the most aggressive rider. 82 Kristofer Dahl (Can) Team SmartStop all s.t. 90 Benjamin Chaddock (Can) Garneau - Québecor s.t. 95 Davide Frattini (Ita) UnitedHealthcare Professional Cycling Team all s.t. 97 Simon-Pierre Gauthier (Can) Garneau - Québecor s.t. 102 Gregory Daniel (USA) Bissell Development Team s.t. 105 Matthew Goss (Aus) Orica GreenDGE s.t. 15 Daniel Eaton (USA) Bissell Development Team both s.t. 19 Dion Smith (NZl) Hincapie Sportswear Development Team s.t. 21 Simon Yates (GBr) Orica GreenDGE s.t. 23 Davide Formolo (Ita) Cannondale s.t. 58 Eric Marcotte (USA) Team SmartStop s.t. 86 David Williams (USA) 5-Hour Energy s.t.